Dr. Bronner's is a company that sells fair trade and organic products. They have all different kinds of body products. I was sent a variety of products to try including virgin coconut oil, peppermint lotion, lip balm, body balm, soap and shaving gel. I love peppermint products for the shower because it is refreshing and invigorating. These products have the true scent of real peppermint leaves. I really like the body balm which is perfect for dry skin like mine. It comes in a small, portable container that can fit right in your purse. It is not greasy which is really nice. The peppermint lotion is another great product. It was stickier than I am used to but dried eventually. This lotion was moisturizing to use over my whole body. 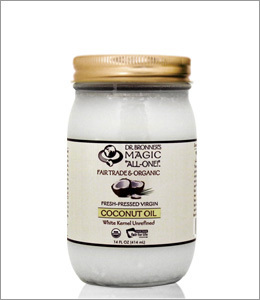 The virgin coconut oil is a miracle product. It can be used both for cooking and for your body. This coconut oil smells amazing. I have been using it on my skin as a thick moisturizer and really like it. I also would use it for baking to give your food a coconut flavor or in a stir-fry. A 14 ounce container retails for $10.99. It is a cold pressed product made from fresh dried coconuts. The benefits are not necessarily proven yet but coconut is thought to help cardiovascular health, improve cholesterol and may help dementia. In fact, at the nursing home that I work at, we have a resident that takes 2 tablespoons of coconut oil daily to help improve his dementia. 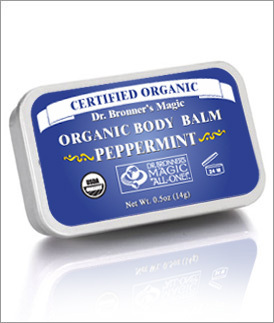 For some excellent skin care products, check out Dr. Bronners. We're definitely fans of Dr. Bronner's products in this house! The only complaint I have is their everything oil doesn't work well with me when I use it for shampoo.